art journalling ,pottery and what not! Whoa! Isn't that just awesome?? She is none other than our very sweet Kripa Kaushik! 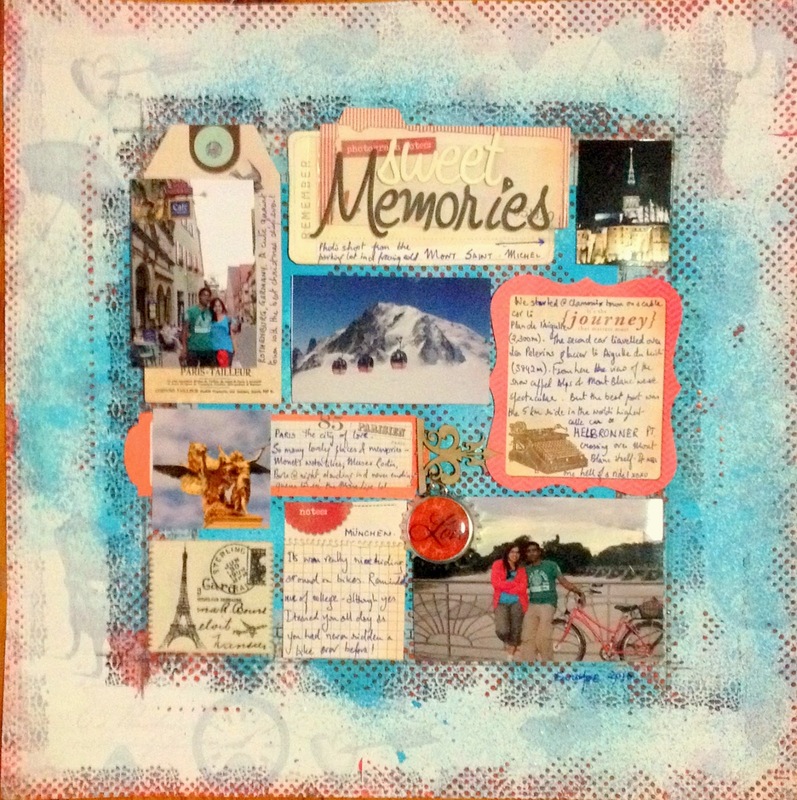 We loved her work so much that we got her here as our Guest Designer for this fortnight and she has a great layout with a detailed tutorial to share with you all today! I am sure you will be inspired . So lets here from the lady herself. My name is Kripa Koushik. I’m from Bangalore, currently residing in the suburbs of Sydney with my family of boys (a bubbly 3 year old with infinite energy, a curious bubba of 6 months who just started crawling and my dear hubby. At first, I found the idea of creating a 12"X 12" layout very overwhelming, now it’s one of my favourite. If you have never made a 12X12, then I urge you to pick up a PP/cardstock, paints, a few vacation photographs and play along with me. In today’s step by step, I'll share with you my process for creating a very simple grid sketch, mixed media layout using 5 photographs from one of my trips to Europe. Step 1: Choose a background paper. Mine had vintage/Paris graphics on it which were quite prominent. Apply a thin layer of gesso using a roller/foam brush to get a fairly even application. Using a wet wipe (baby wipe) remove excess gesso from areas you want to highlight (On mine I removed gesso from the butterflies). Can you see the difference gesso creates? Step 2: While the gesso is drying, on another plain paper, layer the photographs and PP. I find grid layouts very easy specially for multiple photos. I changed some of the elements later, but this what I first had in mind. Step 3: Now comes the fun part. The gesso has dried, its time to bring the paints /sprays out. Using a pencil, draw a square to outline the grid inside which the photos are going to be placed. Use washi tape on the inside border of the square. Spray blue paint around the border (I used acrylic paint and a toothbrush as I don’t have the specific blue colour in a ready spray form). Add a border stamp using black archival ink, once the paint is dry. Any stamp with geometric pattern will do. Its to add interest and define the border a little more. Then go over the borders with texture paste mixed with Fevicryl cherry red pearl paint through a small dots stencil. Now, my background looks like this. The remaining texture paste was randomly applied around the border and inside the grid as I didn't want to waste it. Here is a close up…… can you see the 6 layers? PP, gesso, washi, spray, stamp and finally texture paste. See, mixed media isn't so difficult , you can do it too. Didn't you all just fell in love with her layout? I sure did! Such a beautifully scrapped page to cherish her memories. Thank you so much Kripa for this really detailed tutorial. I am sure many of us will find making layouts much more easier than before! Want to see more of her creations? Visit her blog and don't forget to leave her some love there. Do hop over to our Current Challenge#29 - Vacation/Travel/Holidays Theme where only layouts are allowed. If you haven't already, then .. you still have some time left. Take out your best picture form a Vacation /Holiday.. Or maybe some place you want to escape to this summer. Just scrap about it and show us! You might win some goodies before the Great Escape!! Its, Karuna here. Hope you are enjoying all the fun Lo's by the DT! 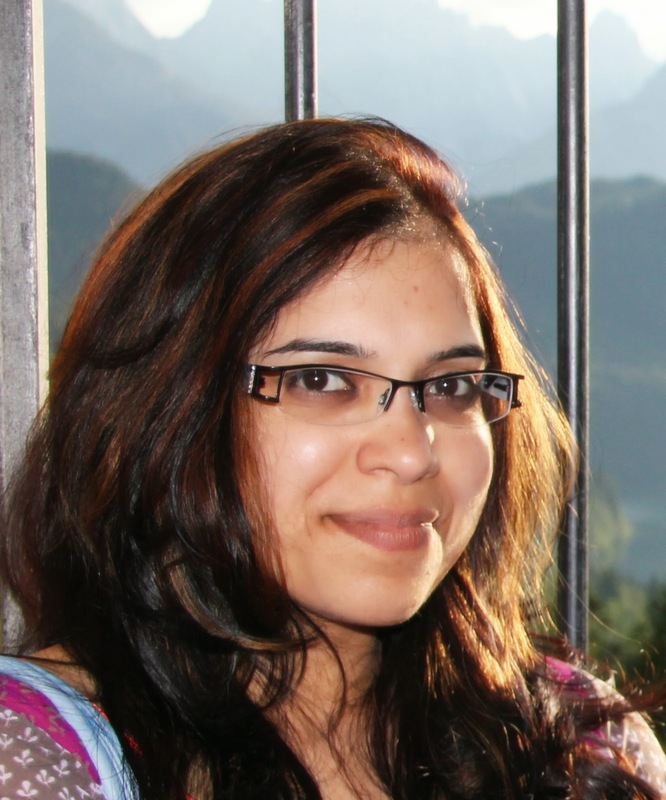 Today alos happens to be Pooja's last post and I just wanted to thank her for the amazing inspirations she has shared with us here at Lulupu Blog over the last few months. It has been wonderful having her as DT. I have got to know her more and she is such a warm hearted and fun girl. I wish her well for her future endeavors! Thanks Pooja!! We will miss you! Hello my lovely lulupu's ! Its Pooja here , One last time for the lulupu blog. But time has come for me to move on with other things in life. All you readers gave me so much love ... that i will miss. But im really happy that now i can participate in the challenges as and when time permits ! 1. Create a layout ( only layouts will qualify) of size 8"x8" or a larger one if you would like . 2. The theme of your layout must be based on vacation/travel/ holidays. 3. Must showcase LAYOUTS only with coordinating theme. 4. The inlinkz for this challenge will close on April 30th 2014 11:55 PM IST so make sure to link up before that. Here is my Lay out. And thats why i have created a Mini layout this time. The Size is 6.5 X 6.5 Inches . Hence the colors Blue yellow and grey. 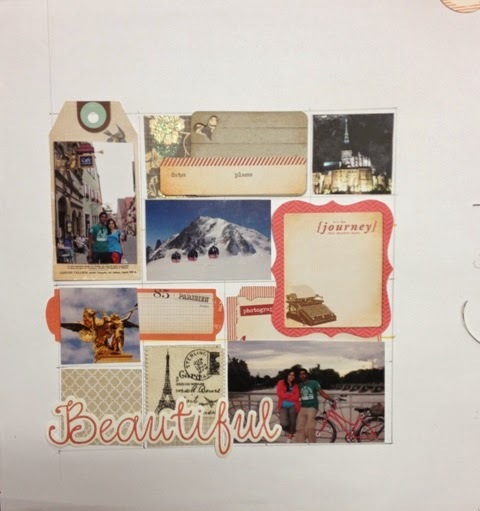 Here is a closer look at the travel elements that i chose to incorporate into my LO. The yellow and blue flowers are handmade. I love giving a torn look , that way you can push in other papers for a lovely effect. Here is my sentiment , The word FUN is a die cut , SUN is done in chipboard letters , i painted them yellow. The hand written part well my handwriting is never neat ! I chose to do a bit of layering under the photo with a film stirp , over which there is a Tag , from the tag pad , under which i added some Lace and then the Photo on top ! Hope u liked my LO ! Thanks a lot for tuning in !